In recent years technology has made it possible to study as never before how the brain works and what can effectively change and heal it. Neuroplasticity, the opening of new neural pathways in the brain, is the key factor. I developed a therapeutic app to help this process, called Mind Warrior â„¢. For those caught in a relationship with a sociopath, the brain’s response to the ongoing trauma puts us in “survival mode” and we can lose our grip on the ability to cope (choose positive and healthy ways of feeling). Indeed, we can be stuck in the cycle of abuse and deception, which produces feelings of confusion, unsafety, self-doubt, and hyper vigilance, so that our ability to focus our attention on our needs or even be connected to ourselves fades. Then we begin to break down, unravel, and lose ourselves. Any earlier conditioned default wiring may also be magnifying our reactions in our current situation and further hijacking our ability for objectivity and conscious choice in the moment. The sociopath always takes the role of perpetrator, which can trigger our responses to any earlier abusive or traumatic situations we may have been in, including the one we are now in! These can be feelings of low self-esteem or powerlessness and shame of being victimized. Recognizing that the reaction in the present as basically triggering a flashback is very empowering! It starts to put us back in the driver’s seat. The beauty of consciously addressing the trauma of being in a destructive relationship in a strange way forces us to heal any connected underlying trauma as well. Mind Warriorâ„¢ helps you do exactly that. It takes you through the steps of recognizing and connecting to the trigger. It then provides a variety of ways to take action to move along the negative feeling state and feel better. As you practice this you realize that you can better control those conditioned responses and flashbacks, care for and recover yourself faster, all the while strengthening your coping skills instead of continuing to lose them. The connection to self prevents further loss of self and builds the self-esteem and strength you need to go forward in a positive way. If you have left a relationship with a sociopath, Mind Warriorâ„¢ can help you recognize and catch those triggers that have made you break your no-contact rule or even go back, and stop that cycle. Once you have achieved permanent no-contact, Mind Warriorâ„¢ can help you learn to calm, soothe, and release the triggers of PTSD so you can start healing your brain and your spirit. Substance and Compulsive Behavior Trigger page can help to keep you from being lured back into the relationship, or resorting to addictive behaviors. Daily Focus page helps visualize and plan your day ahead with awareness and control. Weekly Review page helps to view success, plan for the week ahead, and stay focused. Lifestyle Goals page helps plan for goals for overall well-being. History saves all input so you can track your progress. Email Option — you can email any inputted information to connect to others, to begin to come out of the isolation of being in a destructive relationship. You can also email input to a therapist or sponsor to aid therapy and reach your goals. Mind Warriorâ„¢ is now available in the iTunes App Store or Google Play. I checked out the Mind Warrior app that Mary Ann created and it offers a great way for you to stay on track as you’re recovering from an entanglement with a sociopath. 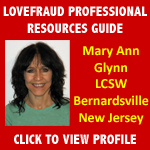 I encourage Lovefraud readers to check it out!